Updated stock: go to our 'Sales' page for more details. Pictured above: Lockerley Eagle L335. The Lockerley Herd of Pedigree Aberdeen Angus was established in 1998 with the purchase of 10 "Nightingale" cows and the entire"Burningfold" herd of 60 cows. We have since retained selected home bred Aberdeen Angus females and expanded the herd to 110 breeding cows. 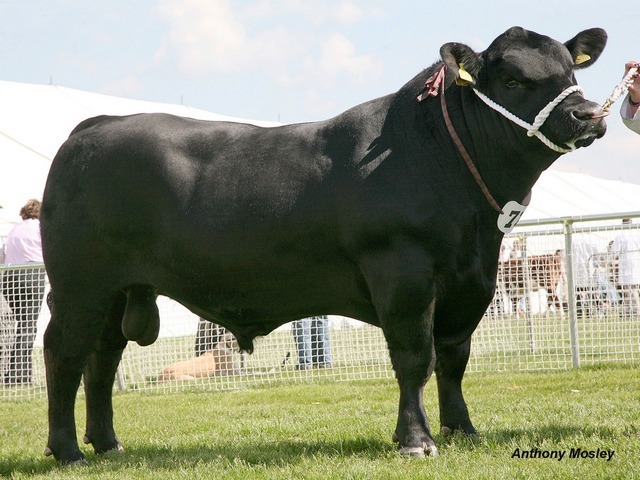 The "Burningfold" herd of Aberdeen Angus had been established 25 years earlier with purchases of cows from the "Kirktonlees" and "Kinermony" herds and two "Haymount" bulls, Wavalo and Evebar. Our initial Angus stock bull was "Nightingale Dalgleish" sired by "Youngdale Hogan". He was joined by "Netherton Eastern Cruz" sired by "Dalrene Cruz" in 1999 and "Nightingale Pascall" sired by "Eileenmere Lad" in 2000. These bulls have made a tremendous impact on our herd. Lockerley Hall Farms are CHeCS accredited free from Johnes, Lepto and IBR. We vaccinate for BVD.